PM Nguyen Xuan Phuc and his Dutch counterpart Mark Rutte agreed to upgrade Vietnam-Netherlands ties to the comprehensive partnership level during their talks in Hanoi on April 9. The Vietnamese PM assured Dutch Prime Minister Mark Rutte that Vietnam always values the strengthening of ties with the Netherlands, one of the European Union (EU) partners of top importance to Vietnam. Rutte, for his part, said he is impressed by Vietnam’s socio-economic achievements over the past five years. He spoke highly of Vietnam’s improving stature on regional and global scenes with the successful hosting of major international events, including the second DPRK-US summit. He affirmed that the Dutch government and business community want to continue bolstering all-round ties with Vietnam, evidenced by the presence of over 70 leading Dutch firms during the visit. Commenting on the active, effective, and dynamic development of Vietnam-Netherlands friendship and cooperation, both sides said there is still room to develop bilateral ties. The Netherlands is currently Vietnam’s second largest European trade partner, with two-way trade at 7.8 billion USD in 2018; and its largest European investor, with the total registered capital of 9.55 billion USD. Both leaders pledged to create favourable conditions for the two nations’ enterprises to enhance joint work in the priority fields of agriculture, marine-based and circular economy, and smart city development. 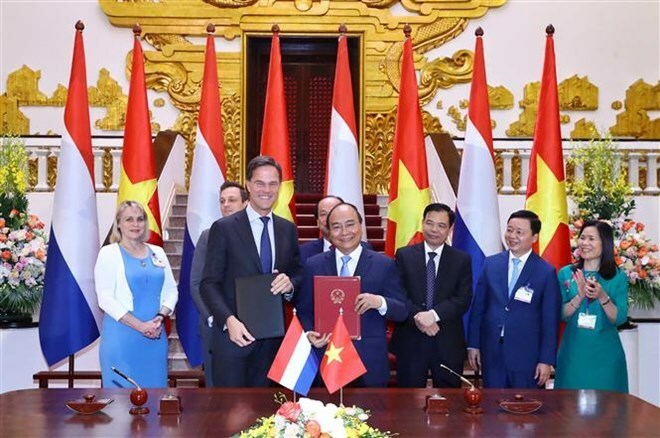 Rutte expressed his support for the early signing and ratification of the above deals, contributing to promoting trade in each market and global trade liberalisation between Vietnam and the EU member states, including Dutch companies. On regional and global issues of shared concern, they vowed to offer close and mutual support at multilateral forums, such as the United Nations, and the ASEAN – EU cooperation. On the occasion, both sides issued a joint statement on the outcomes of the official visit by the Dutch PM. During his stay in Vietnam, the guest met Party General Secretary and President Nguyen Phu Trong and National Assembly Chairwoman Nguyen Thi Kim Ngan. In the evening the same day, the Dutch PM attended a sustainable fashion show co-organised by the Hanoi municipal People’s Committee and the Dutch Embassy at Ly Thai To Park before flying home, concluding his visit to Vietnam.